Click the photos to view each of the autumn-themed sun catchers up-close. 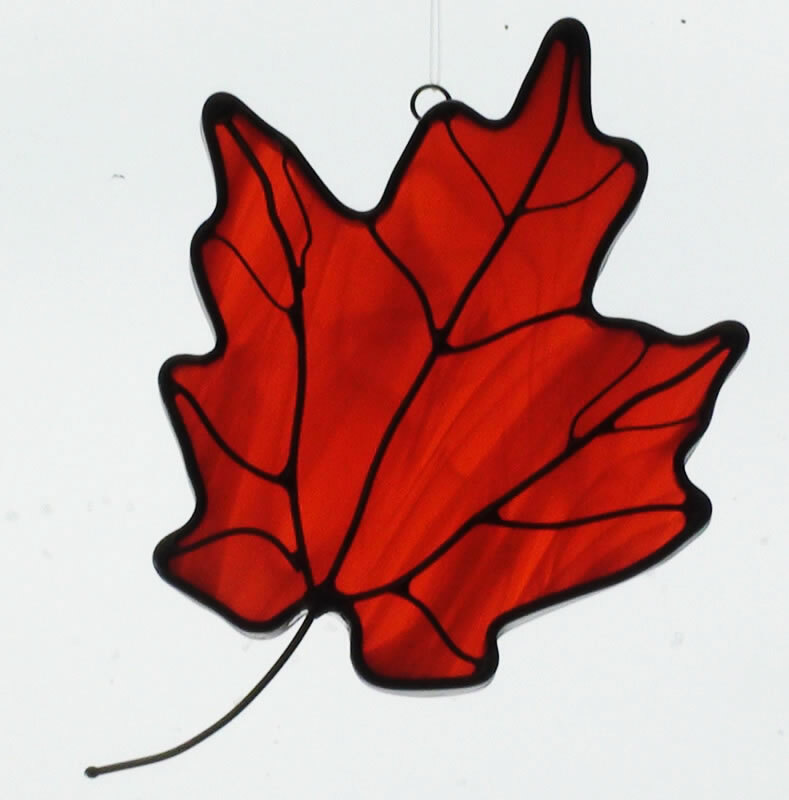 DESCRIPTION: A single, intricately cut Maple leaf with three different sizes of wire representing the veins and stem. 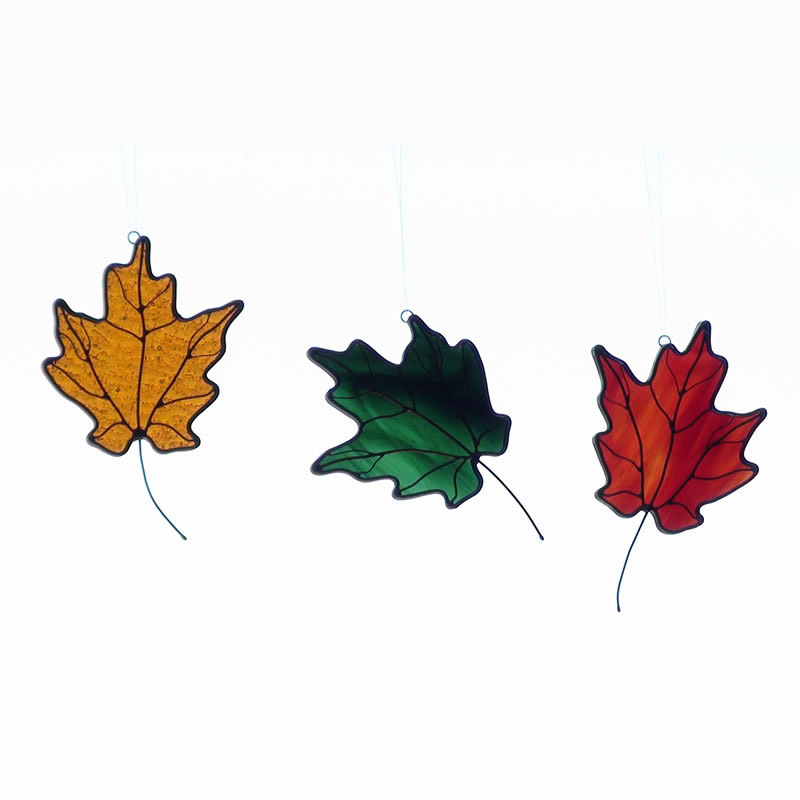 Each leaf can be hung in different positions by attaching the ring in different places. 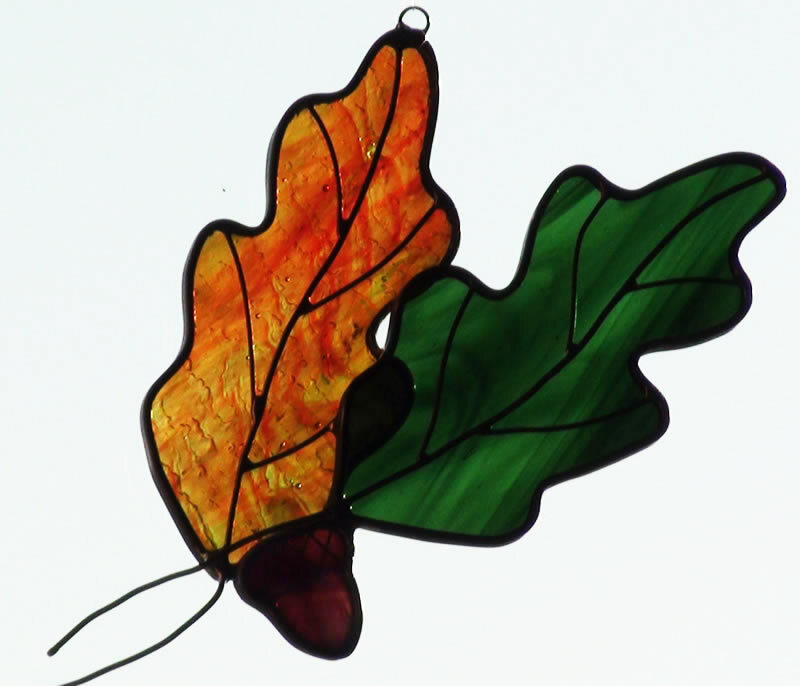 This Maple leaf is available in assorted colors and textures including red & amber mixed both smooth and textured; amber & red mixed both smooth and textured; amber smooth and textured; orange transparent and streaky; and olive green. The textured glasses result in a sparkling effect when the sun shines through, bringing out the brilliant autumn colors. The streaky orange glass is semi-transparent and produces strongly visible color without direct sunlight. this item is also available as a night light. 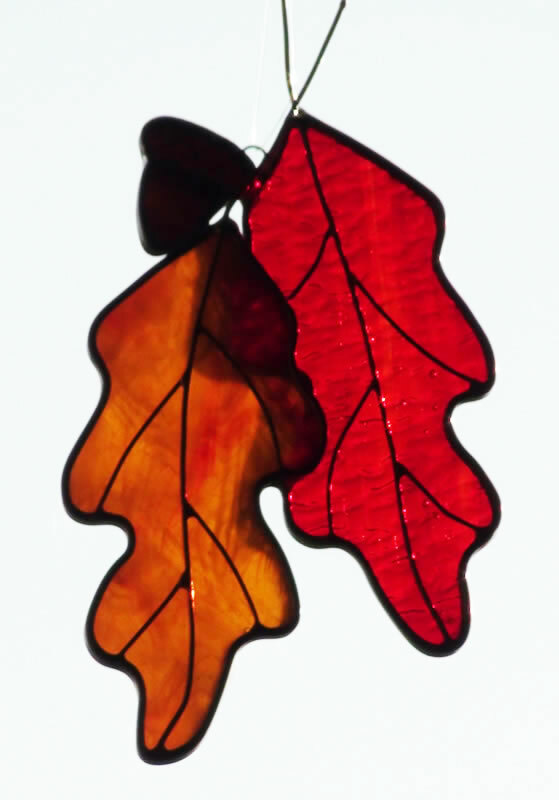 DESCRIPTION: These leaded stained glass sun catchers consist of two intricately cut Oak leaves with wire accents for the veins and stems. A small, brown acorn with wire detailing is attached to the leaves that can hang pointing up or down. They are available in several color combinations with either smooth or textured glass. The streaky glasses like orange and yellow are semi-transparent and have strongly visible color without direct sunlight. 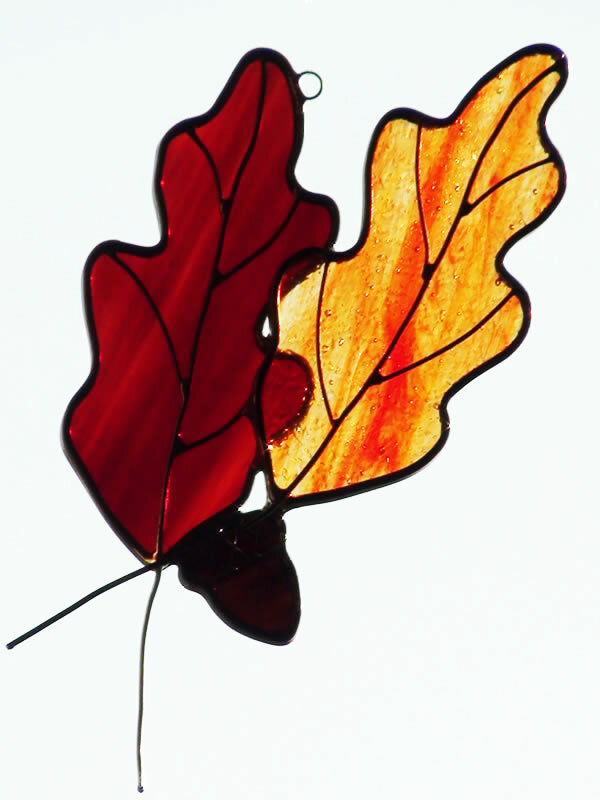 The textured glass results in a sparkling effect when the sun shines through, bringing out the vibrant autumn colors. Color choices include combinations of red & amber mixed both smooth or textured; red & green textured; amber smooth or textured; rust opal; orange transparent and streaky; yellow opal and olive green. 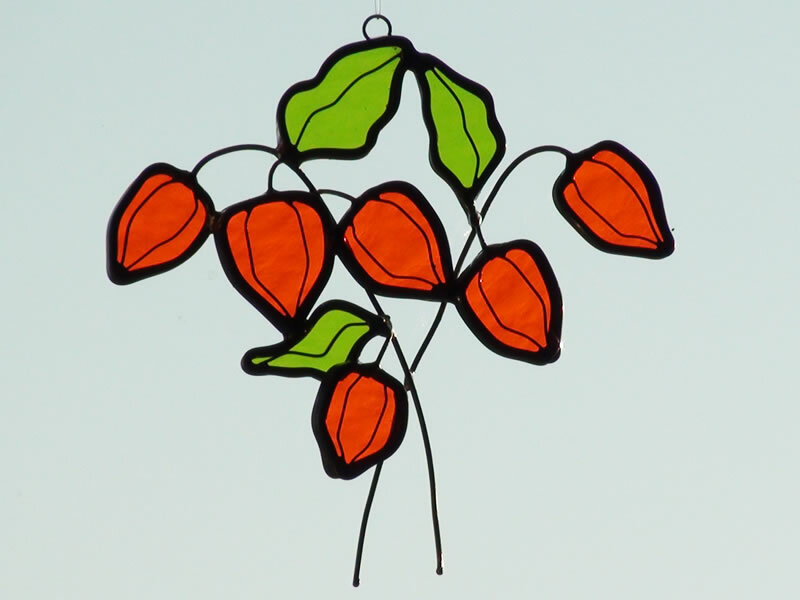 DESCRIPTION: Orange Chinese Lanterns with green leaves on wire stems. Wire accent lines define the ridges in the lanterns. 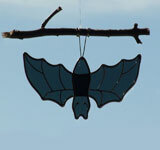 DESCRIPTION: A dark gray bat hangs upside down from a real wood twig. Each twig is unique with different shapes, sizes and coloring like you find in nature. 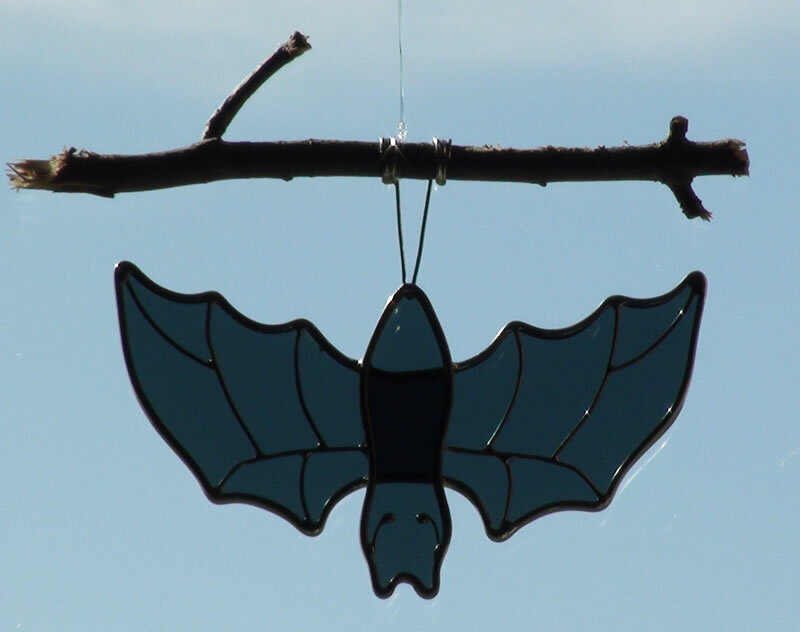 Wire accents define the wings, eyes and feet of the bat. 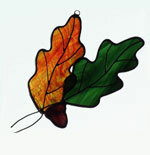 DESCRIPTION: This tiny stained glass sun catcher makes a great autumn decoration alone or in an ensemble of sun catchers. 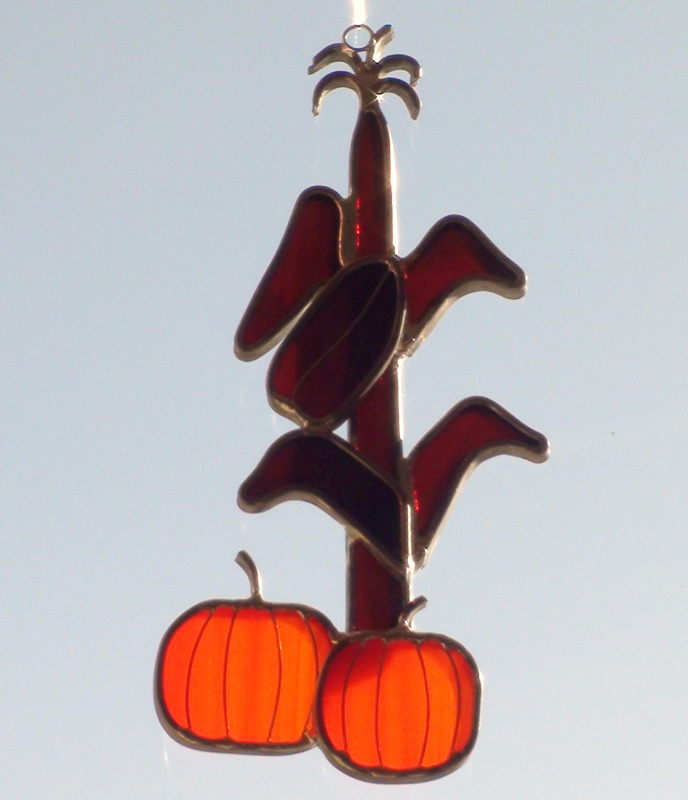 The bright orange color of the pumpkins contrasts with the brown cornstalk creating a silhouette effect. Measuring 3 inches wide x 6 inches high, each sun catcher is different because of the random size and shape of each pumpkin. The pumpkin lines and stems are made out of wire. 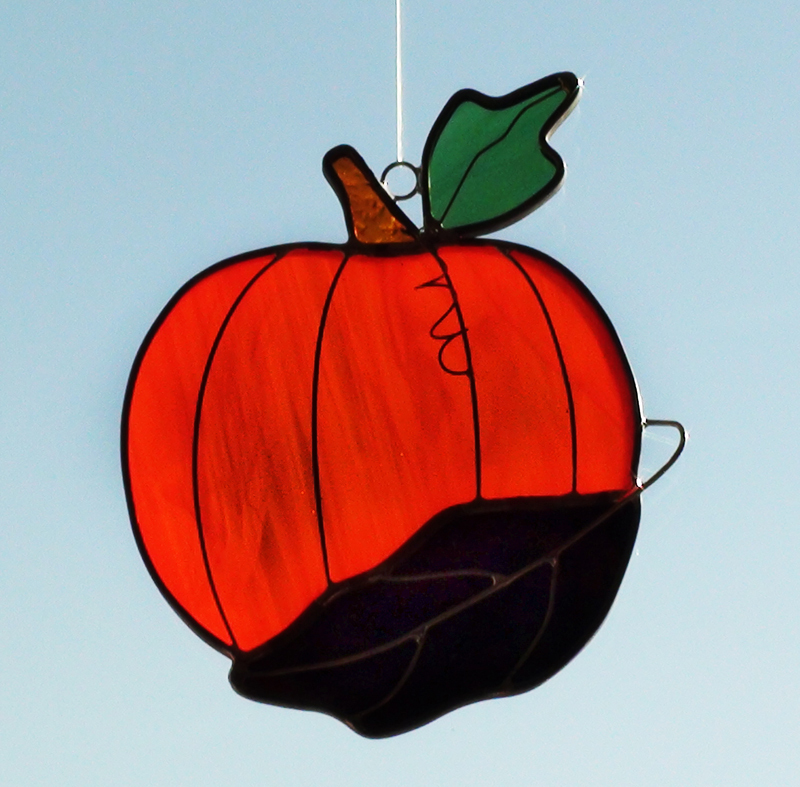 DESCRIPTION: A bright orange pumpkin sun catcher that can accompany any autumn décor. The pumpkin is detailed with wire lines and has a small green leaf attached to the amber stem. A large brown leaf drapes across the front. 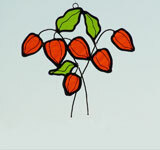 Wire accents also detail the stem and veins of the leaf. This item measures 4 ½ inches wide x 6 inches high. The orange glass in this picture is a streaky looking translucent glass which will permit light to shine through with varying shades of density to create an interesting and a more realistic look. Clear orange glass that allows light to shine through brightly is also available. 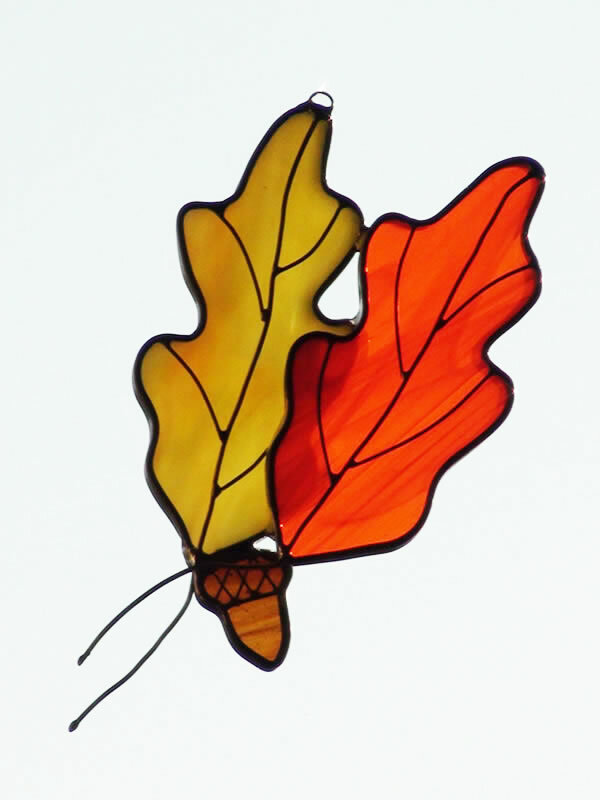 DESCRIPTION: Two small stained glass pumpkins that will attract attention in any space with the orange of autumn. Tiny brown pieces of glass representing randomly fallen leaves lean against the pumpkins that are detailed with wire lines and stems. 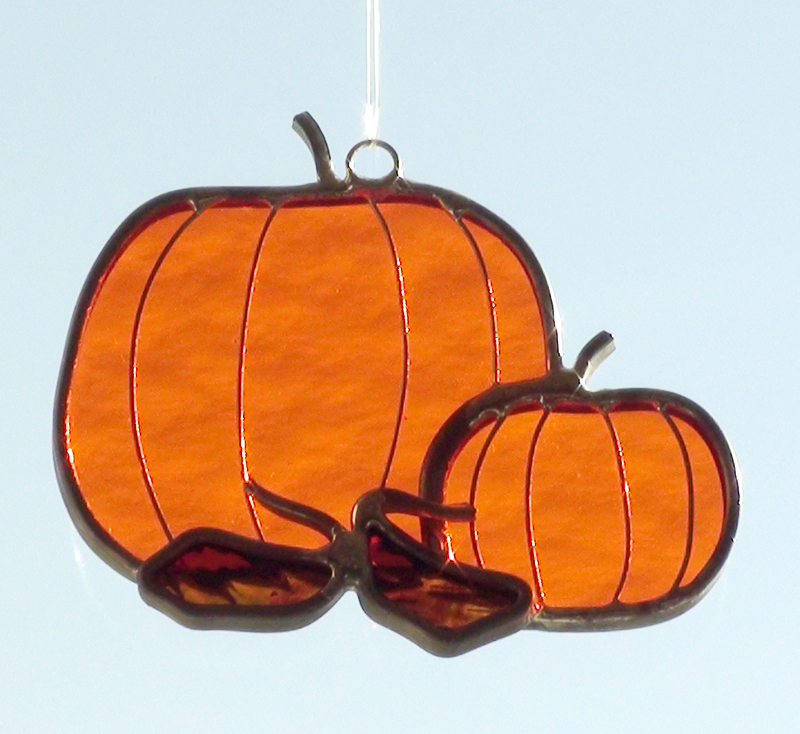 These miniature pumpkins measuring 3 inches wide x 2 ½ inches high, also make a great accompaniment with other autumn sun catchers. The pumpkins in this picture are made from clear orange glass and sunlight will shine through brightly. A streaky looking translucent glass is also available which results in a more realistic effect by allowing light to shine through with varying shades of density. 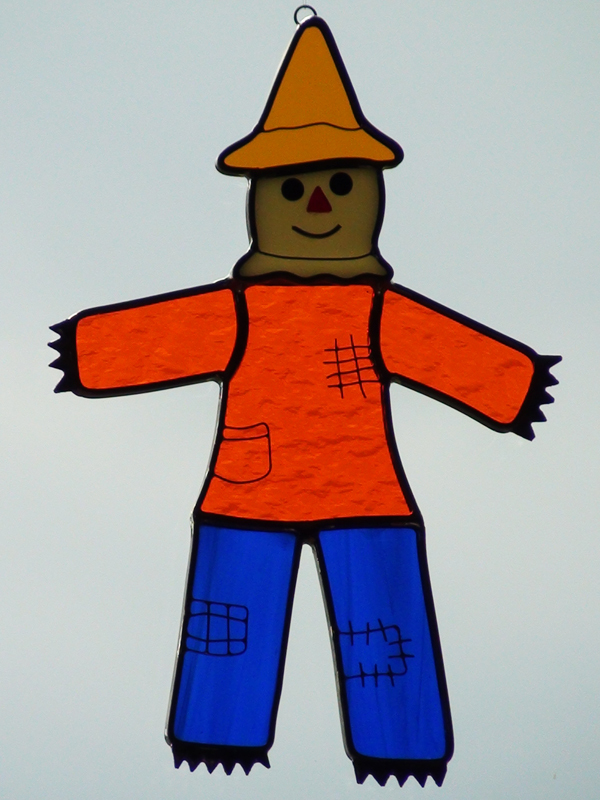 DESCRIPTION: This friendly stained glass scarecrow makes a wonderful autumn decoration. His face is made from tiny glass nuggets, a cut glass nose and wire mouth. Each is securely glued to the face with a special glass glue. The pockets and patches on the sleeves and pants are each unique. Tiny pieces of wire are cut and bent, then delicately soldered individually to create the look of tattered and stitched areas. Autumn colors are used for the clothes. This picture has blue pants, an orange shirt and an amber hat. Other colors are available in other listings or by special order. This sun catcher measures 6 inches wide x 8 inches high. A matching piece is the scarecrow as a plant stick and can be found in another listing.